Thinking I may have completely missed, I waited almost an hour before checking the impact site. At about this same time, Dad who had been hunting nearby joined me. Together we slowly approached where I had shot the deer. The impact site had blood splatter 6 feet high on the beech tree behind the animal, indicating a complete pass through. The splatter quickly transformed into a heavy trail of vibrant crimson filled with bubbly froth. Another 100 feet and blood stained oak leaves showed where the animal had fallen. All initial sign had the components of a good shot and promise of a quick recovery. A clean miss or no shot is much more attractive than a poorly placed shot and a wounded animal. At approximately 200 yards from the shot site, I noted the blood had already started to clot and long strings of blood lay on the ground, another 10 feet and nothing, not a drop. Puzzled, I continued to walk in the general direction I expected the deer to walk (down hill and toward water). After several hundred yards, I returned to the bright orange flagging that marked last blood. As Dad retraced my steps, I decided to climb the ridge on the slim chance that the wounded animal had run uphill. On the top, I was surprised to find a small blood drop. Now notably worried, that the deer wasn't as injured as I originally thought, I collected the old man and we decided to sit for another hour before tracking any further. 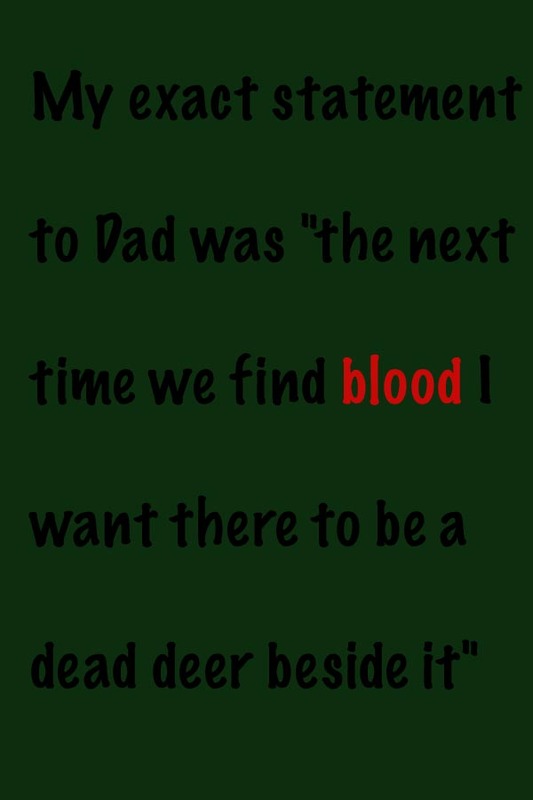 My exact statement to Dad was "the next time we find blood I want there to be a dead deer beside it". The extra hour was nerve wracking but with plenty of day light and rain not predicted until late evening it was the smart choice. As we restarted our search my watch read 12:30 PM a full 3 hours after the initial shot. Indentations in the leaf litter now indicated the deer was moving down hill toward an extensive alder bog. Several sets of deer tracks and lack of blood had us on our hands and knees examining every track to see if it contained even a minuscule amount of blood. Every pinkie nail sized drop of blood provided us with new found hope. Five additional hours of searching using an extensive grid system, yielded no trace of the wounded deer, like the forest had come alive and swallowed it whole. Our exploration of the bog yielded it could not be navigated without chest waders, an option that would require a 2 hour round trip. At dark (6:00 PM), the old man and I finally returned home exhausted after covering miles of mixed terrain and not having eaten or drank anything since 5:00 AM. The story continues Monday November 22nd . . .
November 22nd is on a Tuesday. The 22nd is actually Monday! Either way I corrected . . . thanks! Rest of the story has been posted.